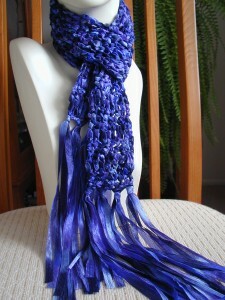 This scarf is a breeze to make with just one ball of the Lionbrand Incredible Ribbon yarn. It is great for a splash of color to add to your outfit or for a child’s scarf. If you want to have a longer scarf, use 2 skeins. Finished Size: 2 ¼ inches wide by 60 inches long including the 10 inch fringe on each end. Gauge: Don’t worry about the gauge! Repeat row 2 and 3 until scarf is 40 inches long ending with Row 3. Cut 24 pieces of ribbon that are each 21” long. 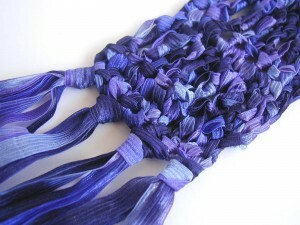 Using 3 strands of ribbon for each fringe, fold in half to form a loop. Insert crochet hook in sc at end of scarf. Pull loop through and draw ends of the fringe through loop and pull to form knot. Do this evenly 3 more times across end of the scarf. There are a total of 4 fringes on one end of the scarf. Repeat on other end of scarf. See How to Add Fringe or Tassels Using a Crochet Hook for a photo tutorial if needed. Have any questions or comments? I will be happy to answer any questions you may have in the comment section! This entry was posted on Thursday, February 10th, 2011 at 12:31 PM by Robin Beers	and is filed under Free Crochet Patterns. You can follow any responses to this entry through the RSS 2.0 feed. You can leave a response, or trackback from your own site. Nice scarf, looks like something my nieces would love. Thanks for the pattern. Where can i buy ribbon yarn? Hi Krystal, you should be able to find it at any major craft store that carries yarn. If not, feel free to do a search for it online. Hey , thanks for the idea for this scarf, I have three skeins of this brand ribbon and no patterns that work with it. I wonder, I’m new to crochet so maybe I’m not doing it right, but it seems when I follow the pattern that all the turning chains end up on the same side. When I tried a swatch it came out uneven and wonky even though I was counting my stitches and everything.I ended up changing it a bit: I did the foundation chain, and then the sc, then I did two consecutive rows of tr and then a row of sc, the sides seems to stay more even that way. Thanks for the idea, I love the open weave of this simple and easy pattern. My ribbon is rainbow so it’s a big shiny strip of multicolors, and it looks awesome. Does the ch 4 count as a treble? Hi Nikki, the ch 4 doesn’t count as a stitch in this pattern. It would only count as a stitch if it was indicated in the pattern. Hello, as soon as I saw the ribbon, I fell in love. I’m on my way to Hobby Lobby to buy the ribbon. Thanks for the pattern. I was at an antiques mall in Verona, VA yesterday and a vendor sold me four skeins of Filater di Crosa Fancy- Venezia yarn in a slightly variegated blue. Have never seen or heard of it before. Went to their site and all their patterns areally in Italian and for knitting. I crochet. Can I use it for this scarf for an adult? Please help. Thanks!